With multi-level interactive voice response (IVR), or phone trees, route customers to the right agent or department, provide recorded responses for frequently asked questions, and deflect calls by allowing callers to switch the interaction to text. If you use Talk Team, you don't have access to IVR but can route calls using group routing. For details, see Routing incoming calls to groups of agents. Customers on Zendesk Support's Essential plan do not have access to group routing or IVR. Create a menu with options callers can choose through key presses. You can build a simple phone tree with one level or, if you have a complex support team structure, layer multiple menu levels together. Each IVR menu requires at least one IVR greeting listing the options and corresponding key presses. If your IVR menu will be complex with multiple levels and options, you might want to come back to this step after you've built out your menu (see Creating an IVR menu). Note: Only Support administrators can modify or delete greetings. See Promoting an agent to the administrator role. Follow the steps to create a custom greeting in Managing outgoing greetings. 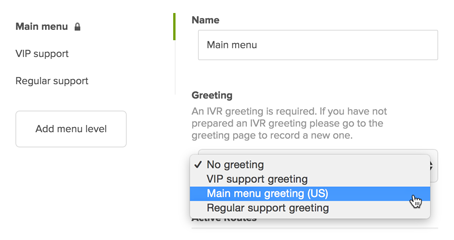 Select IVR greeting as the greeting type. The way you structure your IVR menu determines how callers are routed and what options they hear. In the Settings tab, enter a name for the menu. Select the Menu levels tab. The first menu level, Main menu, is already created for you. If you want additional, secondary menu levels that callers can reach from the main menu, click add level. Click on the name of a menu level to edit it. Optionally, enter a custom name. Select an IVR greeting from the drop-down menu. Note that only greetings of the type IVR will be available. Click Add Route to add a new menu option. From the Keypress drop-down list, select an available keypress number or select Default. If the caller hasn't pressed a key after the greeting plays three times, or if the caller presses the wrong key three times during the greeting, the default route will be used. If you haven't set a default route, the caller will be disconnected. Select an optional greeting which will be played to the caller before they take action on the call. Note that this greeting must be of the type IVR. Voicemail: Routes the call to the number's voicemail. Keep in mind that if you haven't selected a greeting in the field above, no greeting will play (just the beep and straight to recording). When you select a voicemail action, you'll also be prompted to enter a group that voicemail tickets will be associated with. Group: Allows you to select a group of agents to route the call to. When you select the group action type, you'll also be prompted to enter the group calls will be routed to. Unless a greeting is assigned to this group, the caller will be placed in the queue and hear the Wait greeting set for the number. The Available Agents greeting will not be played. For more information about managing groups, see Creating, managing, and using groups. Number: Routes the call directly to the specified number. When you select this action type, you'll also be prompted to enter the number to route calls to. When routing to an external number in an IVR, that call is not recorded in Zendesk, nor is a ticket created for the call. Additionally, the number you enter cannot use an extension number. Important: When you route a call from your IVR to another number, you will incur an extra charge for the call forwarding. 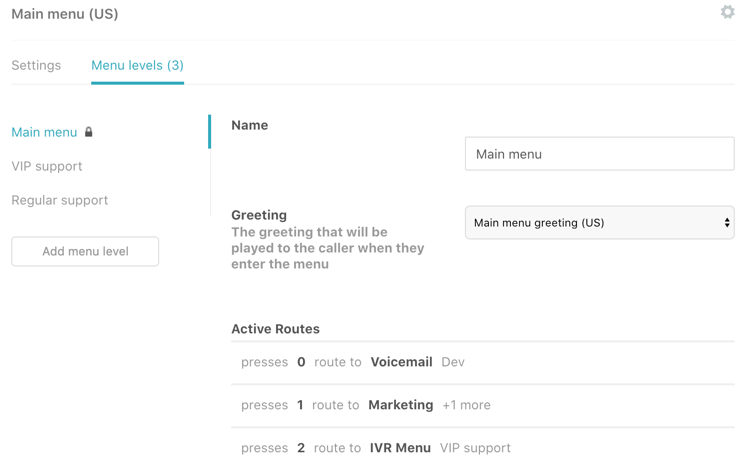 IVR Menu: Routes the call to another menu level within the same IVR menu. For example, you might want callers to press 1 for VIP support from the main menu, then be directed to another menu with options for VIP billing, VIP sales, etc. When you select the IVR menu action type, you'll also be prompted to select an IVR menu that calls will be routed to. Repeat steps 10-15 to add additional routes. Click Save to save the IVR menu. Once you've built your IVR menu, assign it to a number. Toggle the Enable IVR? field to on. Select the IVR menu you want to use from the drop-down list. 2.. Can I set a custom voicemail message for a particular IVR menu? Or is there only once standard voice mail message that callers get routed to regardless of what menu of the tree they are in? 3. How do you recommend testing out your phone system to ensure it works properly? I'm an existing "talk" customer so I'm not sure how best to trial the IVR prior to releasing it to my customers. This is something that I think fairly obviously, most people would want to do. P.S. This article references a video, "watch the following video", I don't see one linked anywhere. I have the same questions as Matt. 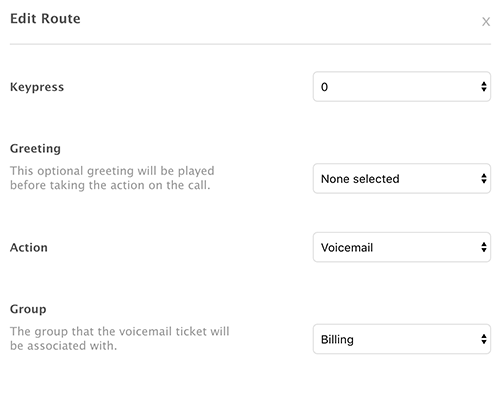 Also, is there an option to route calls to a different number, if the queue reaches its max? Could we receive a response for this? I did end up putting these questions to a support agent who kindly spoke to a product champ to help me out. If you have a secondary IVR setup (this is done through adding another number), the call will go through the first, and go through the second. If no one on the second IVR answers, the call will go to voicemail. You may set a custom voicemail for each IVR option. The catch here is you'll need to set the type as "IVR Greeting" in order to use it for your IVR when you're saving the greeting. You may only have one voicemail option for each IVR number. To test this, you could add another line to your account temporarily. An additional line is only $1 and you could cancel it once your testing completed. This would be a great way to keep your testing separate from your 'live' numbers. #1. Glad to know I can split like this. It's how I was set up but both were going to the same voicemail message. #2. Sales part of the problem for #1 in that at least I can have two different end points... one for each and a custom message for each. That's good. My follow question is that for 1 IVR I want to go to VM after hours (good there) for the second one I want to forward to an outside number. This is the tough nut to solve for. Any suggestions. I will set up a test and see if I can create as you described and make any other breakthroughs. Does the IVR support voice recognition or is there an integration that would allow the customers to verbally provide information? At this time the Talk IVR doesn't support voice recognition, but that's a really interesting idea! I checked over in our Product Feedback forum and don't see that anybody else has suggested it yet, so I'd encourage you to head over there and create a post sharing your detailed use case and why this functionality would be helpful for your company. It's possible to route to a number if there is not agent is available? Instead to voice mail. Can we route to a multiple numbers like extensions? I'm going to get someone better versed in Talk in here to help you out. Stand by! Thanks, wait for you guys. Can I route to a number if no agents are available? Yes. If your IVR routes to an agent group or to a Zendesk Talk phone number where no agents are available to take the call, the caller will be directed to voicemail. You can also route an IVR option directly to voicemail. Can I route to combinations of numbers, like extensions? No. Your IVR menu options can only use a single digit to make a selection. You can nest multiple IVR menus together, but each menu can only use single-digit options. I hope this helps clarify things! actually the IVR plays the welcome message 3 times before moving to default routing, this is not good behavior as we should play 1 time, wait silently then move to default. or simply provide a box to select number of times to play message or how many seconds to wait. at this time how can we avoid repeating 3 times. At this time it is not possible to control the amount of times a greeting is repeated. I've taken a look and found the following related discussion about the functionality you are looking for: https://support.zendesk.com/hc/en-us/community/posts/360000699348-IVR-Welcome-Message-repeat-option When you get a moment feel free to stop by, up vote the request and share your use case. Our phone forwards to Zendesk talk but the IVR will not work. If I dial the Zendesk Talk number directly it allows users to press 1 2 or3 but if it is forwarded it does not. Is there anyway to fix that? we want to set up an IVR that if the caller press 9, goes at english (we have done this) but if the caller doesn't press anything, it routes the call to a specific group (like we dont have the IVR). I kept getting the confirmation of my number, hitting '1' to get the textback, the recording repeated the number confirmation.